We want to thank Gallery RIVVA and its staff for making available their gallery. We want to thank Nonno's Pizzeria and The Riverwalk Bar and Grill for supplying the Refreshments, and The WIRE and The Roosevelt Islander for its many articles of this event. Here's what the FDR Hope Memorial is all about. More on the FDR Hope Memorial unveiling at the Gallery RIVAA from prior post. 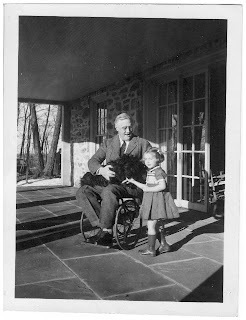 For more information about the FDR Hope Memorial and to make a donation please click here. 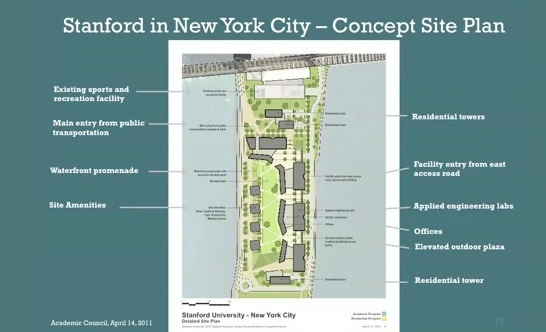 Updating post from earlier today, I just received the video below of the presentation made by Stanford University President John Hennessy and other Stanford officials on the proposed Roosevelt Island site for a Stanford New York City campus. ... used charts, photographs and maps to take the audience on a "visual journey" of Stanford's proposal to build a New York campus. One location offered by New York City that Stanford is considering is on 2-mile-long Roosevelt Island, located in the East River between Manhattan and Queens and home to about 12,000 people. "It is a unique place, mainly used for housing, hospitals and recreation," Reidy said. "It is a special place in that it's oddly apart from the city, but very closely adjacent." Reidy said some existing buildings would be demolished, creating a 10-acre site for the new campus. "Think about 10 acres in close proximity to Manhattan," Reidy said. "That's really hard to come by. From that perspective it is a great opportunity. But it does have its challenges." The comments concerning Roosevelt Island begin at about the 18 minute mark. I particularly liked Mr. Reidy characterization of Roosevelt Island's transportation issues - the subway is good, car and bus are challenged and the Tram is just odd. By a process of elimination, Stanford University wound up at Roosevelt Island - kind of like many of us already here. How this turns out is going to be very interesting and exciting! More information on the proposed Stanford Campus and New York City's plans for an applied research and engineering school at these prior posts. Update 4/17 - A way to insure that Roosevelt Island residents object to Stanford University or any other institution taking over the Goldwater Hospital site is if done with the mindset of "colonizing" Roosevelt Island as indicated in this blog post by the Stanford Review. and Columbia University on Broadway/ Amsterdam Avenues in Morningside Heights. My understanding is that a gated enclave is not what is intended for a Roosevelt Island campus by Stanford but using words like "colony" can create unnecessary anxiety, even if they were not made by a Stanford official. Here's an update on Stanford University's proposal to to build a state of the art engineering and applied research school at Roosevelt Island's Goldwater Hospital site. Graduate students seeking a prestigious business or technology degree from Stanford University may no longer have to come only to Silicon Valley to get it - that is, if New York City officials select Stanford from 27 universities vying for the chance to build a campus there. 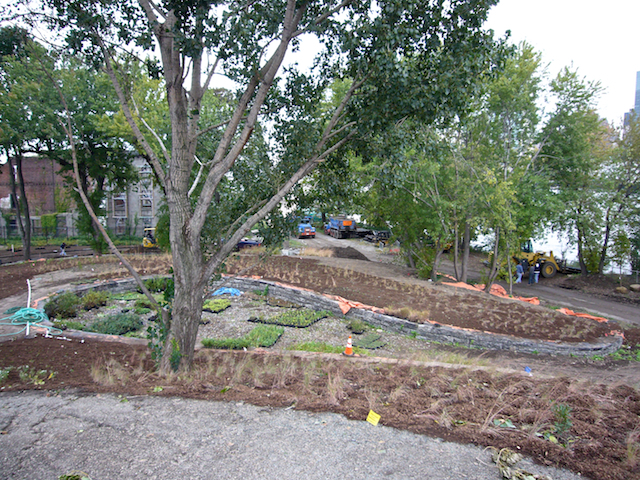 ... “It is a special place in that is oddly a place apart to the city but closely adjacent,” Reidy said of the 10-acre Roosevelt Island location. Here's an excerpt from President Hennessey's speech. ... As you have all heard, we are also exploring another opportunity, the possibility of establishing an engineering and technology research and graduate education campus in New York City. The full text of Stanford President Hennessy's address to the Academic Council is here. ... Hennessy’s address was followed by a panel featuring School of Engineering Dean Jim Plummer, Computer Science Chair Jennifer Widom and Robert Reidy, vice president for land, buildings and real estate. According to Plummer, there are three questions to address at present: whether a 21st century university can have multiple locations, whether telepresence systems work well enough and whether Stanford’ entrepreneurial spirit can be replicated elsewhere. There is one challenge, however, that seems to take precedence. “The biggest part will be making the New York campus look, feel and be part of us,” Plummer said. Widom noted that it would take her department “a while to ramp up” for the transition to NYC, especially with respect to hiring additional faculty members. She said the computer science department “will not lower its threshold to hire faculty” for the Big Apple center and that many CS professors have expressed interest in teaching there. Reidy took the Academic Council on a “visual journey” of the potential Roosevelt Island site for the NYC campus. The other sites offered by the city of New York were located in Staten Island, Governors Island and the Brooklyn Naval Yard. “It is a special place in that is oddly a place apart to the city but closely adjacent,” Reidy said of the 10-acre Roosevelt Island location. He added that the University was “quietly trying to pursue a Manhattan location” for an alternative site. The process of “comparing and contrasting opportunities” is important, Reidy said. According to Hennessy, the opportunity to try to recreate Silicon Valley in New York is one that cannot be passed up. “New York is the cultural capital of the United States,” he said. But there’s more to the city, too. “As a native New Yorker, I’m looking forward to the pizza,” Hennessy added. ... Vice President for Land, Buildings, Real Estate Robert Reidy offered a more detailed view of how a campus in New York might actually look. First, he briefly outlined why Stanford preferred a Roosevelt Island out of four possible sites: Staten Island, Governors Island, Brooklyn Naval Yard, and Roosevelt Island. Staten Island was remote, Governors Island has bad infrastructure, and the Brooklyn site was industrial zoned, but the Roosevelt site worked well, since it was close to both Manhattan (center of NYC) and Queens (place for cheap expansion and start-ups). Roosevelt Island would have a 10 acre site in close proximity to Manhattan, with the Queensboro Bridge going over it. It has good subway connection and an interesting tram system, but poor car access. What would the actual island look like? Ultimately, there would be two 20-story housing facilities, one at either end of the campus, as well as academic buildings surrounding a green. The academic facilities might reach eight or so stories in order to capitalize on the space. When faced with a question about whether this was the best use of Stanford’s resources, President Hennessy stated that the city has indicated it would make a commitment, so we could mobilize extra resources. However, this project cannot not be achieved without significant new fund-raising. If Stanford can’t attract new philanthropic support (such as from New Yorkers and New York-based donors), this expansion cannot occur. ... Ellie Titus ’11, former Stanford Daily editor-in-chief asked about what other, non-financial challenges Stanford might face in setting up this campus, especially political. The direct response was that Stanford needs vested rights before Mayor Bloomberg leaves office in 2013 or else the deal will likely fall through. Stanford has at least received assurances that this will be a merit-based process, not a political boondoggle, so that is why Stanford remains involved. Perhaps Stanford would consider the proposed Trilogy skyscraper project, lovingly referred to as the Roosevelt Island Tower of Death by our friends at Curbed, that was developed by some Italian students as part of it's campus on Roosevelt Island. 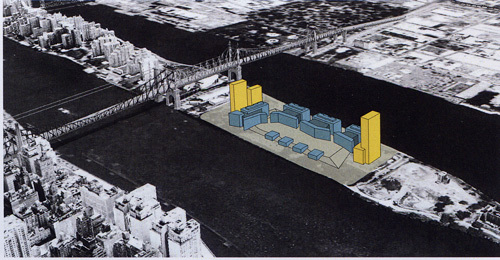 Though only an academic study, the Trilogy skyscraper included a pedestrian bridge from Southpoint Park over the East River to Manhattan. Watch the video and see for yourself. Pretty Cool! 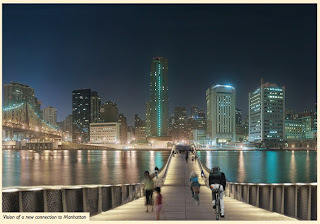 Or maybe this pedestrian bridge from Roosevelt Island to Manhattan that was proposed by Hunter College Students (Page 63 of Roosevelt Island Accessibility Study) could be considered by Stanford? and the Roosevelt Island Residents Association (RIRA) sent a similar letter to those interested academic institutions and the NYEDC. I received reply emails from Stanford, and NYEDC saying they were very glad to receive the letter and basically feel free to comment, question etc over the process. with the beautiful Roosevelt Island Cherry Trees blossoms. 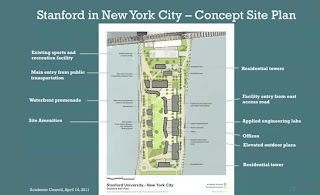 UPDATE 6:25 PM - Video of Stanford's presentation on proposed Roosevelt Island campus is now available here. Decrepit and Broken State of Roosevelt Island's Meditation Steps - Will RIOC Repair Before Nice Weather Returns? Before the End of Summer, Before the Next Snowstorm? 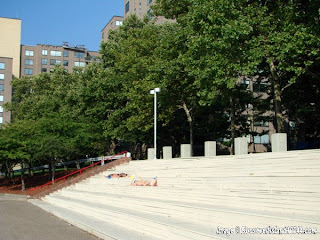 Roosevelt Island's Meditation Steps is a great place to sit by the East River and watch the boats go by, have a bite to eat, get some sun, think, read a book or just relax. with holes where wooden boards should be. Spring is here and Summer rapidly approaching. I hope the Roosevelt Island Operating Corp (RIOC) starts work on repairing the broken and decrepit state of the Meditation Steps soon so they can be enjoyed by Roosevelt Island residents and visitors as soon as the warm weather arrives. 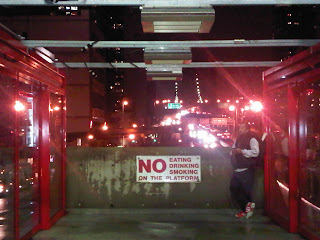 Here's the view from the Roosevelt Island Tram if it was patrolled by Sonny Crocket and Ricardo Tubbs from Miami Vice. The Tram would go much faster if Crockett and Tubbs were patrolling it. Some tram riders, though they appreciate the great views of NYC waterfront and skyline, just want to be able to hold on and not fall down during the ride. there really does need to be straps, metal or leather...if the red bus can have straps, the Tram can for sure...hope they get on that soon, it is like the Tram cars are not finished or they just forgot to make sure 100 people had somewhere to hold onto while in the air? The other day I had the opportunity to be on the Tram with our VP of Operations Fernando Martinez and RIOC President Leslie Torres. I had mentioned during previous meetings that I had gotten several emails or comments that there were not enough places to hold onto currently. I'm 6 feet tall and the rack on the top was still high over my head. I told Fernando that we should either lower the current poles on the top, add some kind of retractable strap to hold onto that doesn't hit people in the face, add extra vertical poles, or some combination of the three. There may be alternative solutions so I asked that we have an expert look at it again to figure out a fix. 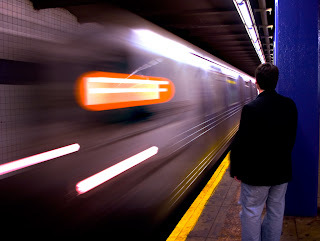 I also have seen, read or experienced myself movement on the Tram while it approaches the towers. The Tram is different from the old Tram in that it uses a fixed cable system and therefore can be used in higher winds because the cables are fixed and don't move. Therefore the Tram cable can't swing on the trip in high winds. It remains fixed. However, when approaching the towers the Tram will center itself which is why you feel that nudge. This is very similar to a speed bump. If the operator moves quickly through it, it is more severe and during high winds, the correction is bigger. I have asked during several operations meetings that we develop a procedure for this during regular operations and high wind situations. If we have to go slower when approaching the tower in order to give a more comfortable ride, I think we should. It just makes sense. Finally, there has been a lot of confusion during Tram outages. We haven't had many, but they have been mostly due to the fact that our Tram has so many sophisticated sensors that detect the smallest issue. This is a good thing. We don't have to rely only on inspections or deal with failures once they happen. We can get that data immediately years before they even start to be an issue. One of the reasons I held back the vote for the Tram when I first got on the Board was I wanted to examine every case where a Tram had failed. I wanted to know why because safety is always the number one concern when dealing with transportation. Since most Trams are built outside this country, I had the court documents translated into english so the RIOC staff, Board and I could review them. We found two major factors to be the issue: improper maintenance and old safety mechanisms. In almost all cases it was a combination of both. Our previous Tram had 1970's technology and the same safety equipment and standards of that decade with some modifications. Our new Tram has redundant safety systems and computer safety sensors in place that simply didn't exist during that period. This is good. I have asked that if we know specifically if there is an issue, that we get the message out, but we make sure it is the right information. So we can better address these issues and questions during our next Operations Meetings, I placed a question on Quora. I look forward to hearing your responses. The Roosevelt Island Youth Program ESL Classes continues with a second semester which started earlier this week. The Roosevelt Island Youth Program ESL class in conjunction with the Mayor’s Office of Adult Education has begun its second semester on Tuesday April 12th at the Youth Center at 506 Main Street. The first session was a major success with over a dozen students speaking over 10 different languages. This semester we have over 30 members speaking at least 17 different languages ranging in ages from 25 to 80. 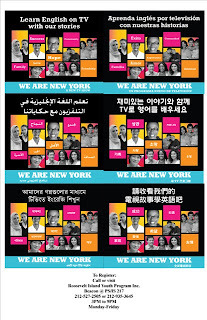 The program is still open for anyone interested in participating, please call 212-935-3645 for additional information. All Images From Roosevelt Island Youth Program Inc. 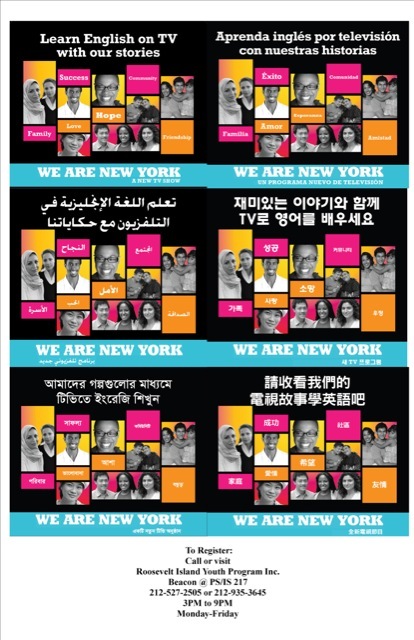 So, if you know a friend, neighbor or family member who could benefit from an English as a Second Language class, please let them know of this RIYP and We are New York program. More information is available from these previous posts. Later tonight, Roosevelt Island's own local Rosemarie & Robin Russell Family Concert Series (R&R Concerts) will be presenting a free evening of classical music with J.S. 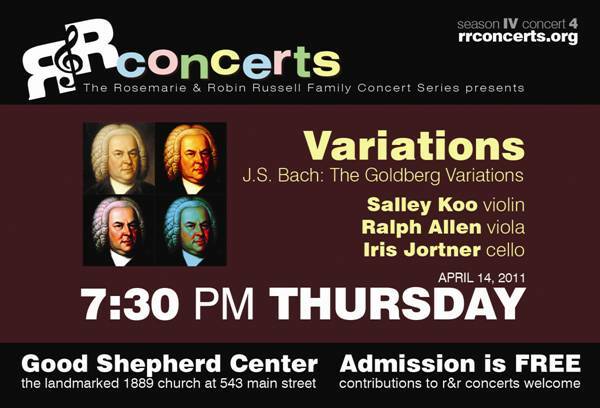 Bach: The Goldberg Variations at the Good Shepherd Community Center (543 Main Street) starting at 7:30 PM. Performing will be Salley Koo and Ralph Allen on violin together with Iris Jortner on Cello. A small taste of J.S. Bach's Goldberg Variations with Julian Rachlin & Friends courtesy of You Tube. More information on the R&R concert series from previous posts. All reports from previous concerts are that if you go, you will have a great time. R&R Concerts were awarded a Roosevelt Island Public Purpose Fund grant from RIOC this year. Enjoy the music and come see why? In case you did not see President Barack Obama's speech today on federal budget reduction and spending priorities, here it is. ... From our first days as a nation, we have put our faith in free markets and free enterprise as the engine of America’s wealth and prosperity. More than citizens of any other country, we are rugged individualists, a self-reliant people with a healthy skepticism of too much government. And so we’ve built a strong military to keep us secure, and public schools and universities to educate our citizens. We’ve laid down railroads and highways to facilitate travel and commerce. We’ve supported the work of scientists and researchers whose discoveries have saved lives, unleashed repeated technological revolutions, and led to countless new jobs and entire new industries. Each of us has benefitted from these investments, and we’re a more prosperous country as a result. Part of this American belief that we’re all connected also expresses itself in a conviction that each one of us deserves some basic measure of security and dignity. We recognize that no matter how responsibly we live our lives, hard times or bad luck, a crippling illness or a layoff may strike any one of us. “There but for the grace of God go I,” we say to ourselves. And so we contribute to programs like Medicare and Social Security, which guarantee us health care and a measure of basic income after a lifetime of hard work; unemployment insurance, which protects us against unexpected job loss; and Medicaid, which provides care for millions of seniors in nursing homes, poor children, those with disabilities. We’re a better country because of these commitments. I’ll go further. We would not be a great country without those commitments. So here’s the truth. Around two-thirds of our budget -- two-thirds -- is spent on Medicare, Medicaid, Social Security, and national security. Two-thirds. Programs like unemployment insurance, student loans, veterans’ benefits, and tax credits for working families take up another 20 percent. What’s left, after interest on the debt, is just 12 percent for everything else. That’s 12 percent for all of our national priorities -- education, clean energy, medical research, transportation, our national parks, food safety, keeping our air and water clean -- you name it -- all of that accounts for 12 percent of our budget. ... This larger debate that we’re having -- this larger debate about the size and the role of government -- it has been with us since our founding days. And during moments of great challenge and change, like the one that we’re living through now, the debate gets sharper and it gets more vigorous. That’s not a bad thing. In fact, it’s a good thing. As a country that prizes both our individual freedom and our obligations to one another, this is one of the most important debates that we can have. “I still believe.” I still believe as well. And I know that if we can come together and uphold our responsibilities to one another and to this larger enterprise that is America, we will keep the dream of our founding alive -- in our time; and we will pass it on to our children. We will pass on to our children a country that we believe in. The full text of President Obama's speech and fact sheet. Republican Congressman Paul Ryan, Chairman of the House Budget Committee responds to President Obama's speech. 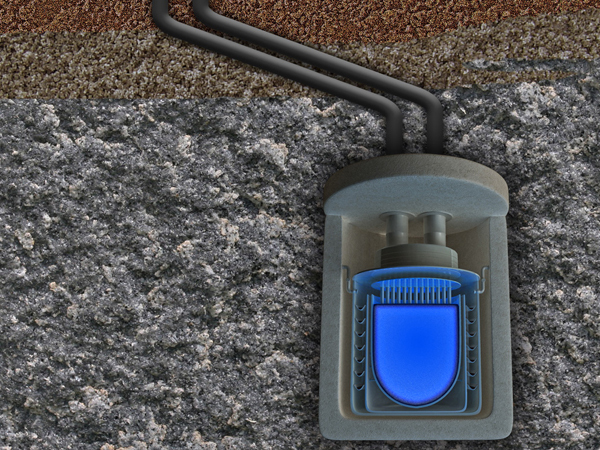 ... Nuclear power is going to be a tough sell going forward given the ongoing radiation leaking from Japan's Fukushima Daiichi power plant, but what if future reactors were buried underground? It may sound like a crazy idea, but Singapore, a tiny island country whose population would have no place to go in the event of a wide-scale evacuation, is giving buried nukes a closer look. This year my office, in partnership with Project Renewal, is coordinating a free mammography screening program this Thursday, April 14, 2011, from 9:30 a.m. to 3 p.m. in front of Lenox Hill Neighborhood House, at 331 East 70th Street between First and Second Avenues. Aside from non-melanoma skin cancer, breast cancer is the most common cancer affecting women in the United States. While there are treatments, early detection is the best way to prevent the worst consequences. By providing this service, women who were unable to get a mammogram in the past can now obtain breast screening services. This service is available for any woman over 40 years of age who has not had a mammogram in the past 12 months, regardless of whether or not she has health insurance. Space is limited to a first- come, first-serve basis and appointments are necessary, so women who would like to take advantage of this opportunity should schedule their appointments as soon as possible by calling 1-800-564-6868. If you have any difficulty or require assistance with scheduling an appointment, please call my office at (212) 860-4906. It is recommended that women who make appointments wear a two-piece outfit, and refrain from using any oil, powder, deodorant, or perfume. If you have Medicare, Medicaid or other health insurance, you must bring your card with you, although you will not be charged any co-payment fees. If you do not have health insurance, the mammogram will be paid for by the Columbia University Cancer Services Partnership. 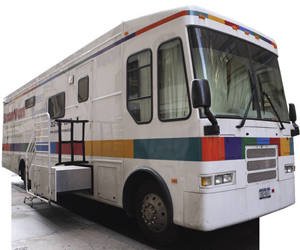 The Women’s Outreach Network Mobile Mammography Program is now operating as Project Renewal Scan Van Program. 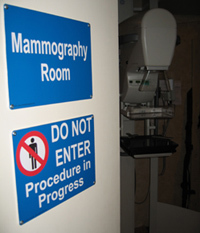 The program provides mammography and clinical breast exams to women on board the Scan Van, a mobile mammography office. Uninsured women are provided with free exams due to the generosity of contributors; Colgate Palmolive, Avon Foundation, Komen Greater New York, Judges and Lawyers Against Breast Cancer, Henry Schein Corporation, Cummings Foundation, Richmond County Savings Foundation, and others. Women that are 40 and older should have an annual clinical breast exam and mammogram. If you have not had a mammogram in the past year, you are welcome to contact us for an appointment or for information. In the past there has been free Mammogram testing during Roosevelt Island Health & Fitness Day usually held in May. No word yet whether free Mammogram screening will be available again at this year's Roosevelt Island Health & Fitness Day. 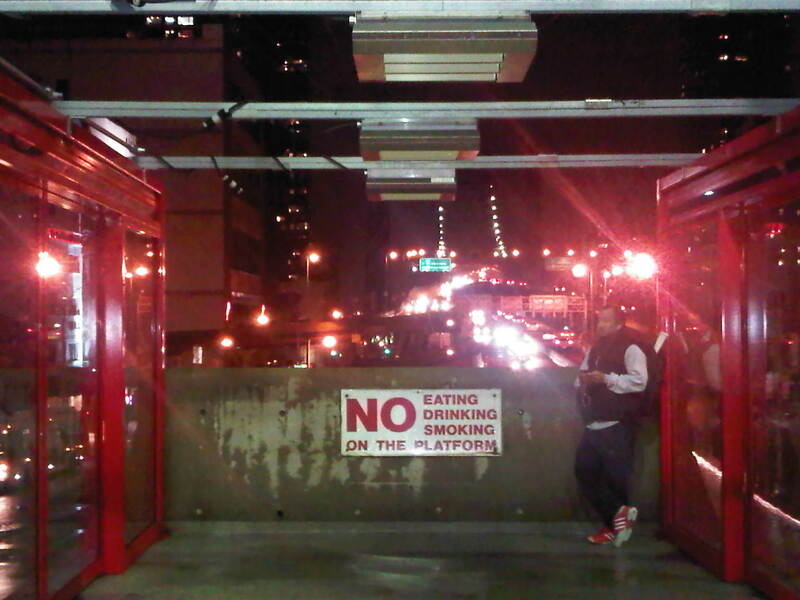 Despite the reflection of light in the attached picture the heat lamp lights on the Manhattan platform were off this cold damp evening on a night where the even neglible warmth they provide would be a blessing. Why ? For some reason they just came on.... Assuming the temp hit the required degree for them to come on... Was cold and wet w-thout them. No screams but south cabin is swinging tonight due to winds. Whatever difficulties the Tram's North Cabin was experiencing last night and earlier today seem to have been fixed. No word yet on what the problem was. Per Tram Supervisor Bob Kelly, due to severe weather and lightening, tram service will be temporarily interrupted until further notice. According to this tweet, Markie had a scary Tram ride. The Public is not permitted to attend an Executive Session. Additional information, though limited, is available on Island House privatization at this earlier post on previous RIOC Real Estate Committee executive session on Island House. Following the April 6 RIOC Board meeting, Island House owner David Hirschorn (in blazer and white pants) spoke with RIOC Directors, Staff and Island House representatives. I asked but was not permitted to join the conversation. ... The law provides for closed or "executive" sessions under circumstances prescribed in the law. It is important to emphasize that an executive session is not separate from an open meeting, but rather is defined as a portion of an open meeting during which the public may be excluded. To close a meeting for executive session, the law requires that a public body take several procedural steps. First, a motion must be made during an open meeting to enter into executive session; second, the motion must identify "the general area or areas of the subject or subjects to be considered;" and third, the motion must be carried by a majority vote of the total membership of a public body. ... (h) the proposed acquisition, sale or lease of real property or the proposed acquisition of securities, or sale or exchange of securities held by such public body, but only when publicity would substantially affect the value thereof. These are the only subjects that may be discussed behind closed doors; all other deliberations must be conducted during open meetings. It is important to point out that a public body can never vote to appropriate public monies during a closed session. Therefore, although most public bodies may vote during a properly convened executive session, any vote to appropriate public monies must be taken in public. Will provide an update if information on the Island House privatization discussions becomes available. 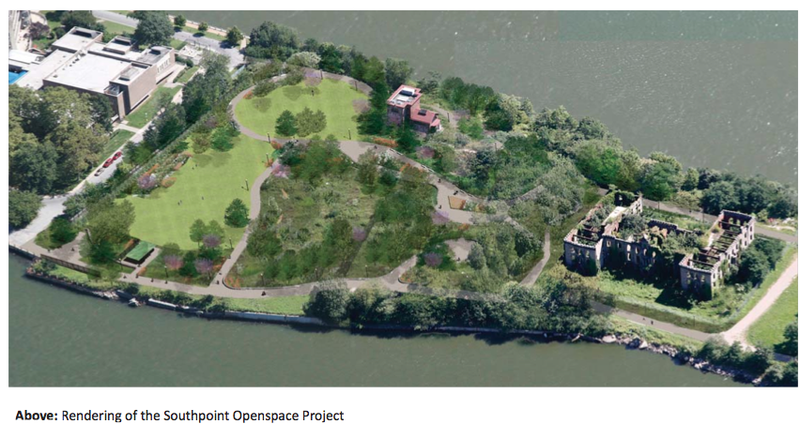 Roosevelt Island is represented by Community Planning Board 8 (CPB 8). A Full CPB 8 Board Meeting will be held on Roosevelt Island this Wednesday, April 13. Below is the Agenda. • Public Hearing: BSA Calendar No. 307-81-BZ; 50 East 69th Street –An application has been filed with the Board of Standards and Appeals for an Extension of the term of a previously approved and extended variance, pursuant to Section 72-21 of the Zoning Resolution, which permitted, in an R8B district, in a five story and penthouse building, medical office use on all floors except the owner’s residential penthouse. The building has been continuously occupied since 1981 by the Center for Specialty Care which has its plastic surgery practice in the building. More on Community Planning Board 8 from earlier posts. There is also a Roosevelt Island committee of CPB 8. Due to the North Cabin having difficulties the rush hour tam schedule will be effected, a limited amount of passenger will permitted per trip until further notice. Due to the North Tram cabin having technical difficulties, the rush hour schedule will be affected. Only a limited amount of passengers will be permitted to board per trip until further notice. Will provide updates as they become available. The Tram is in service but with some minor delays on the north cabin. Still no word on the cause of the difficulties. and transfer to a Coney-Island bound F.
take a Coney Island-bound F to 47-50 Sts and transfer to a Jamaica-bound F .
... My SO works nights and this disruption badly affects his commute home as he can’t get the Tram which stops working at 2 am, so he has to take F train to Queens and then to Roosevelt Island which adds additional 30-60 minutes to the commute because F trains run very infrequently at night. He inquired whether RIOC plans to operate the Tram at night this week and was said, NO. 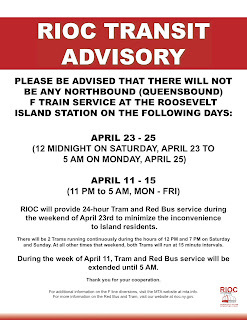 But a train operator said that last week RIOC did operate the Tram the WHOLE NIGHT on days there was no F train service from Roosevelt Island. So why does RIOC run the Tram all night if there is no Manhattan-bound F train at nights, but not at nights when there is no Queens-bound F train??? This is very unfair for RI residents returning home at night. 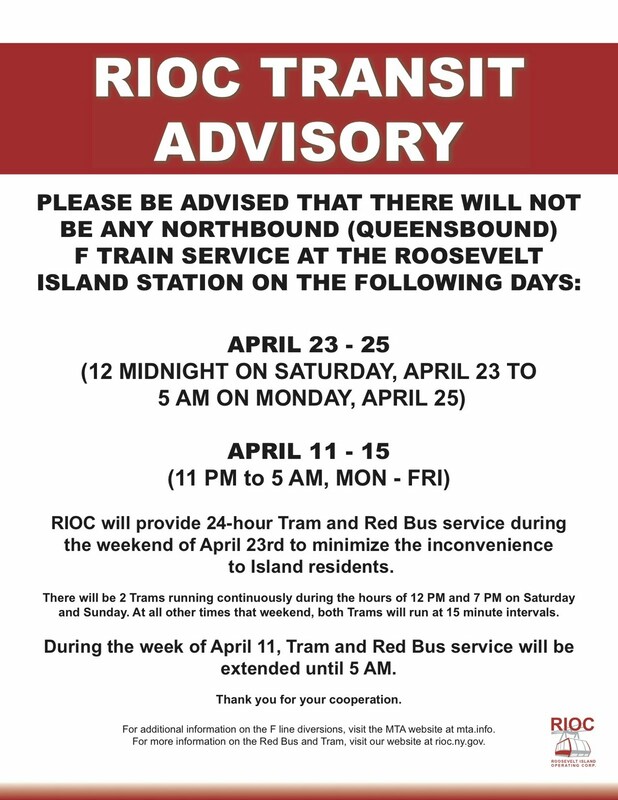 No official word yet from the Roosevelt Island Operating Corp (RIOC) if the Tram will be operating during the hours when there is no late night F Train Service to Roosevelt Island. This past weekend when there was no F train service from Manhattan to Roosevelt Island, the Tram did operate on a 24 hour basis. ... NYPD spokesman Paul Brown added: "Officer Fernandez's transfer has nothing whatsoever to do with the unfounded complaints you cited. To the contrary, he is a highly regarded officer, and he would not have been considered for transfer to a special unit if he wasn't so good." 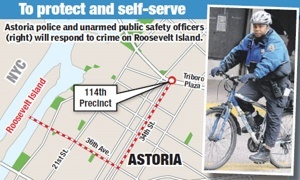 Here's how the issue was discussed during portions of the April Roosevelt Island Residents Association (RIRA) meeting. More on the April RIRA meeting here. A reader asked if the Roosevelt Island Easter Egg Hunt was going to take place this year. I asked Roosevelt Island Operating Corp (RIOC) Vice President of Operations Fernando Martinez who advised that there will not be a Roosevelt Island Easter Egg Hunt this year. 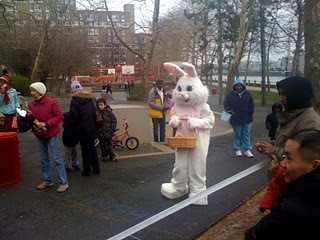 Lack of resources was cited as the reason the Easter Bunny will not be making a Roosevelt Island appearance this year. 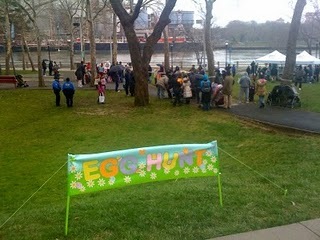 More scenes from last year's Roosevelt Island Easter Egg Hunt from previous post and from RIOC. Mommy Poppins has a list of Easter Egg Hunts in New York City. based to an extent upon this photograph. 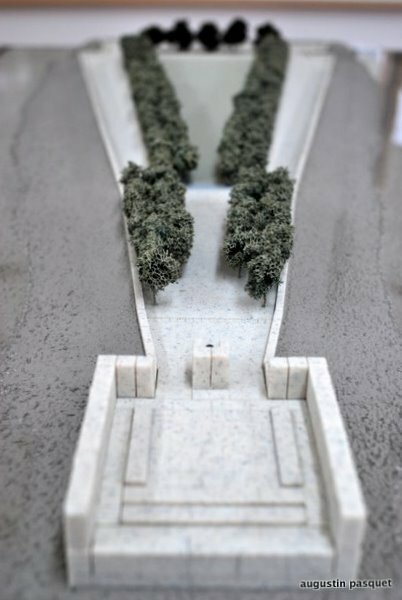 Following a search, New York–based artist Meredith Bergmann was selected to design the FDR Hope Memorial. Bergmann’s public works, such as Marian Anderson and the Boston Women's Memorial, address challenging topics with social concerns. The committee believes her public art experience, her substantial research and thoughtful approach, and her potential to develop and communicate the mission of the FDR Hope Memorial will help to bring about a work of art that will inspire generations. Bergmann notes that the nearby Franklin D. Roosevelt Four Freedoms Park, designed in 1974 by architect Louis Kahn, and now under construction just to the south of the memorial’s future site, will include a portrait head of FDR. “Four Freedoms Park will be both beautiful and contemplative, but because of its idiom and the era of its design it will not depict the human body, and the human body is an important part of our subject. Until the 20th century, sculptors routinely turned to the human body when they wanted to evoke inspiration. Here in the Hope Memorial we are not only allowed to use the human body to inspire, we are joyfully required to do so. Bergmann’s presentation of her concept for realizing FDRHM's mission in three dimensions was received by the committee with great enthusiasm. The design will be presented publicly for the first time on Saturday, April 9, 6 PM to 7 PM at Gallery RIVAA, 529 Main Street, on Roosevelt Island. Initial funding for the FDR Hope Memorial comes from a generous grant from the Franklin D. Roosevelt Four Freedoms Park, a special project of the Franklin & Eleanor Roosevelt Institute. For more information or to make a donation, visit fdrhopememorial. 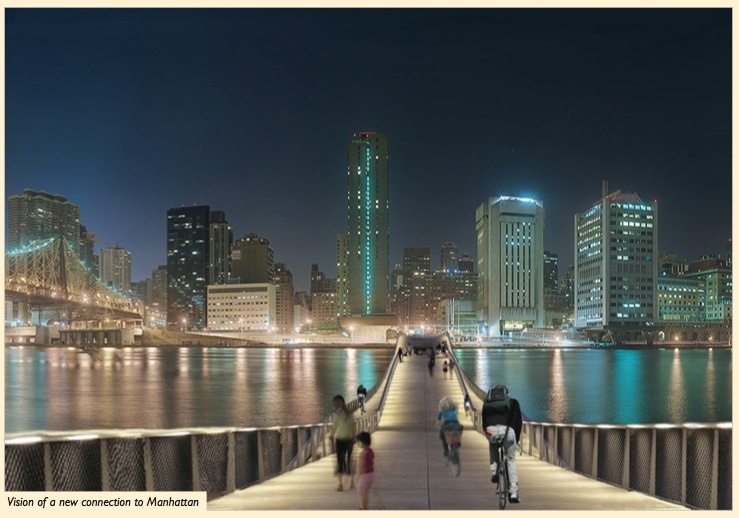 Here are some scenes from last night's FDR Hope Memorial initial design concept unveiling. Roosevelt Island Disabled Association (RIDA) President and FDR Hope Memorial Chair Jim Bates spoke of how he thought just as the election of America's first African-American President, Barack Obama, inspired African-American children to believe that they could accomplish great things, so could the FDR Memorial inspire children with disabilities that they too could accomplish great things as well. Here's the sculptor Meredith Bergmann just before the unveiling. 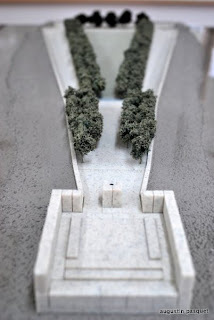 Many more pictures from the FDR Hope Memorial initial design concept are here. Here's how the Memorial to President Franklin D. Roosevelt depicting him as a disabled person began. UPDATE 6 PM - ... With a protest by RIDA against this. UPDATE 7:15 PM - From the FDR Hope Memorial Committee. This says it all.